Autumn is my favorite season by far, I find myself so captivated by the trees and the changing colours of the leaves, the veins within them, the berries and nuts that form creating such beautiful interesting foliage's to enhance our designs. 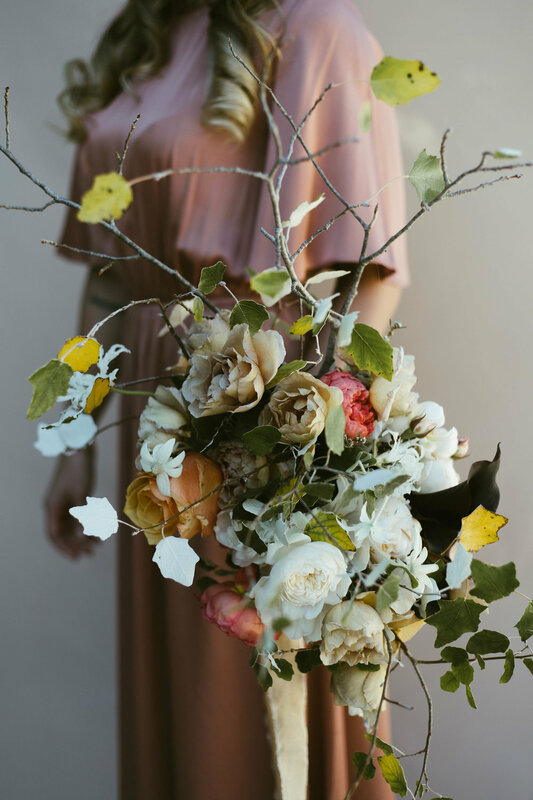 Each week is different until we are left with nothing more than twigs, it truly is so beautiful and with the winding down of a busy season its a great time to get creative for yourself. 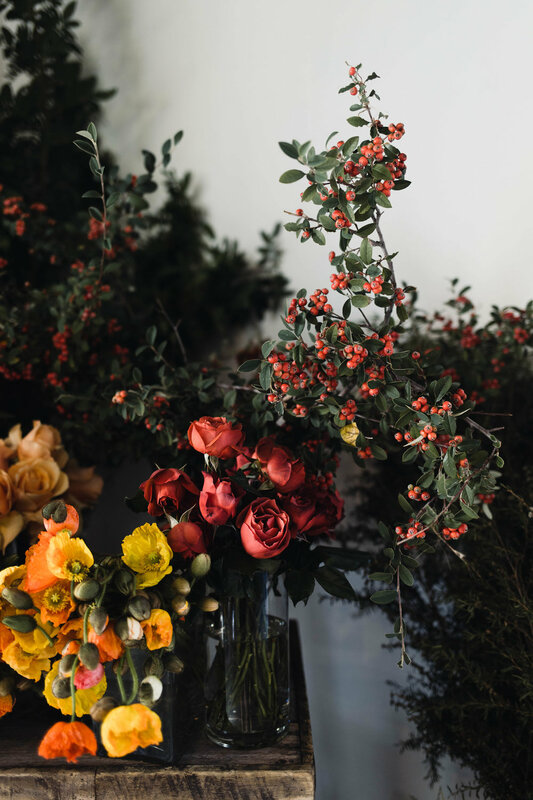 This Autumn we hosted a Bouquet Master Class where I shared my knowledge and approach to unstructured garden style bouquets with a group of lovely ladies. Learning garden style isn't the easiest as quiet often it is unlearning what you are so comfortable with and stepping into a new way that is often uncomfortable and can take some time to adapt to. We really pushed the comfort zones, however the results really do speak for themselves and I couldn't been more prouder of what everyone achieved. Our talented friend Rae Fallon Film Maker Photographer was with us to capture our day, this is a glimpse of what it looked like. Demonstration bouquet featuring David Austin and Garden roses, Narines, home grown Scabiosa, tulips, poppies and foraged Aspen foliage. Finished with handyed silk ribbons. See below the 10 amazing bouquets made by our guests! A couple of the cute buttonholes that were created! 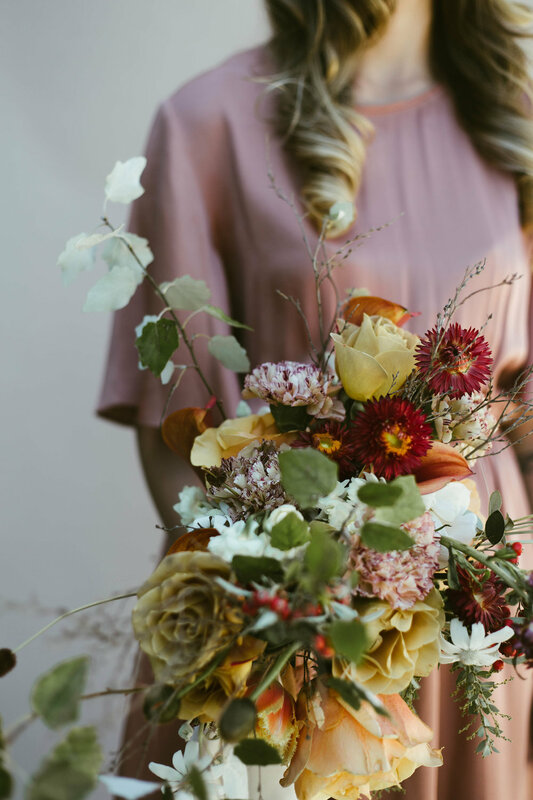 Our next bouquet master class is scheduled for the Saturday 1st September where we will be creating spring bouquets at the farm. Our group classes are currently limited to 6 people to allow us to have more time with each attendee. They are longer in duration making them a full day with a big emphasis on learning the fundamentals behind these designs. Click here for further details and to sign up. Thank you to our stunning model Elise Stirling, Simone Ann Artisty for hair and makeup and Hire Society who were so generous to allow us to use their space and hire items. Also a big thank to the lovely ladies that joined us on this class and work is featured within, you are all so talented.